Halloween is fun for the whole family! 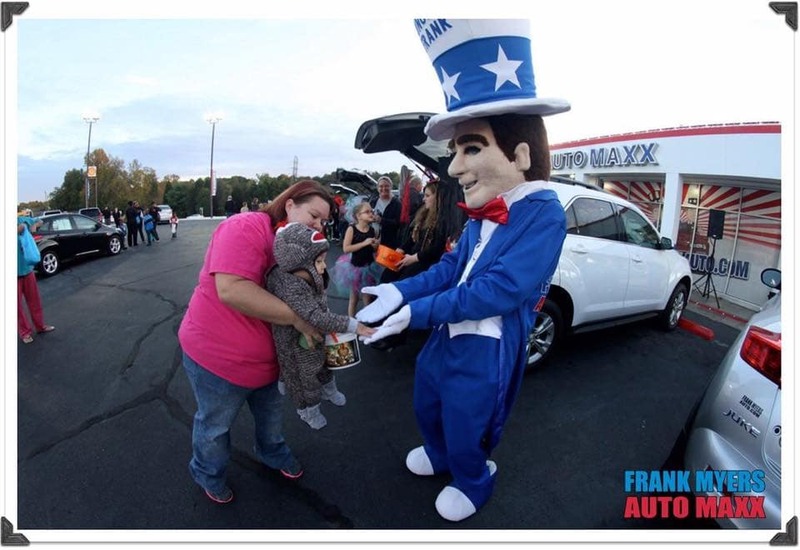 At our used car dealership in Winston-Salem, we love to help our community get into the Halloween spirit, which is why we’re hosting a Trunk or Treat event on our lot! This free event is a great way to test-run your costume and see what kind of reception you get, enjoy some serious snacks, and have a family-friendly night on the town! This rain-or-shine event features a bounce house, a big slide, and music from a DJ in addition to candy, popcorn and drinks! Please come in costume. We request that you leave scary costumes, as well as pretend or real weapons, at home. Parents, if you’re looking for a truly family-friendly night out to celebrate Halloween with the kids, this is a great choice! We love holding this party every year, because we love the Winston-Salem community and want to give back to the town that’s given us so much. We hope to see you at Trunk or Treat on October 19th! When you visit Frank Myers Auto Maxx, you’ll have a positive experience no matter why you head over to see us.